The inner essence of a person is called many things, such as spirit, soul, or personality. It is that core part of friends and family that we love best. And when loved ones die, it is their essence that we miss most. When corpses unleash their restless spirits to return to the land of the living, they are called ghosts. But when living people send their spirits on a visit or quest, does that make them ghosts in life? The Zduhac is a superhero from Serbian folklore. Although he lives among regular villagers, like Superman, he has a super secret. The person destined to become a Zduhac was typically born with a caul (amniotic sack). Moms would save the caul and then attach it to articles of clothing to protect the Zduhac in his dangerous work. Although the piece of caul was not as big as a cape, it was thought to offer cape-like protection to the wearer. In addition to the birth caul, another identifying mark of the Zduhac is tufts of red hair on his body. But these are not the only characteristics of this supernatural being. Solemn, wise, quiet people of stature in the community who also happen to be heavy sleepers might be among the Zduhaci (the plural of Zduhac). And although women and children were sometimes Zduhaci, more often than not, they were men, hence my choice of pronoun in this article. A Zduhac’s spirit leaves its sleeping body at night to protect the village or region from bad weather. After making its bodily exit (sometimes in the form of a fly), the spirit of the Zduhac whisks off into the sky to fight the bad weather demons. Serbian lore suggests that sometimes they fight in teams against other evil Zduhaci bands. On one level, this sounds like a prototype for The Avengers comic and movie franchise. But on another level, there could be something profound embedded in this folklore. In battles with winds that destroy crops, the Zduhac (or Zduhaci band) would fight the whirling weather and redirect it to another part of the landscape, to another region. For the local people, the Zduhac was a hero, a protector, a savior of grave import and value. One way I like to think of the the Zduhac is that he was a weather knight doing thrilling community service. But what about the other places which suffered the ravages of the redirected winds? If Wikipedia is accurate, different bands of Zduhaci fought against one another – the Zduhaci bands hailed from places like Bosnia, Herzegovina, and Montenegro. In an effort to protect their own, they had stormy, airborne tug-of-wars with wind. I find it incredibly interesting that these very same ethnic groups have experienced serious unrest in recent historic times. Does history repeat itself? Is the future based on the past? Are myths based in facts? Might a little of all of the above apply? Books of traditional stories from folklore and mythology are not located in the fiction section of the library. Insights like this provide a clue as to why that is, no? Thoughts? And what do you think about the Zduhac’s ability to transmigrate? Does its temporarily body-free essence, fighting in the windy skies, make it count as a ghost? P.S. Thanks to those who enriched this A-Z series and whose work I enjoyed as well. It has been a pleasure, I look forward to continuing our “blogmunity” over time! There once was a widow whose son, Mulian, became a Buddhist monk. But his commitment to his faith kept him from her. Over time, she grew so angry and resentful that whenever monks asked for food or alms, she refused. When she died, she was sent to the deepest Buddhist hell because of her stinginess. Not only was she tortured with difficult work, but her neck was narrow as a needle, making it impossible to swallow food. She was a hungry ghost. Mulian wondered how his mother was faring after death, so he journeyed into the underworld. After facing many trials and demons, he found the ghost of his hungry mother. She was desperate to eat, but when he offered her food, it burst into flames. After seeking advice from the Buddha, Mulian asked 10 monks to pray and fast for his mother. Ironically, through the efforts of her son and other monks whom she spurned in life, Mulian’s mother was released from her torments and allowed, at last, to eat. From that time on, a Buddhist festival has been held throughout eastern Asia. On the 15th day of the seventh month of the lunar calendar, hungry ghosts are freed from Buddhist hell and fed. During the festival, How Mulian Rescued His Mother is retold in families and other venues. People leave food offerings to feed the hungry ghosts and the ghost of their ancestors. Incense is burned, monks conduct rituals, and performers provide entertainment for everyone, including the ghosts. At many events, the front row of red chairs is reserved just for the ghosts. 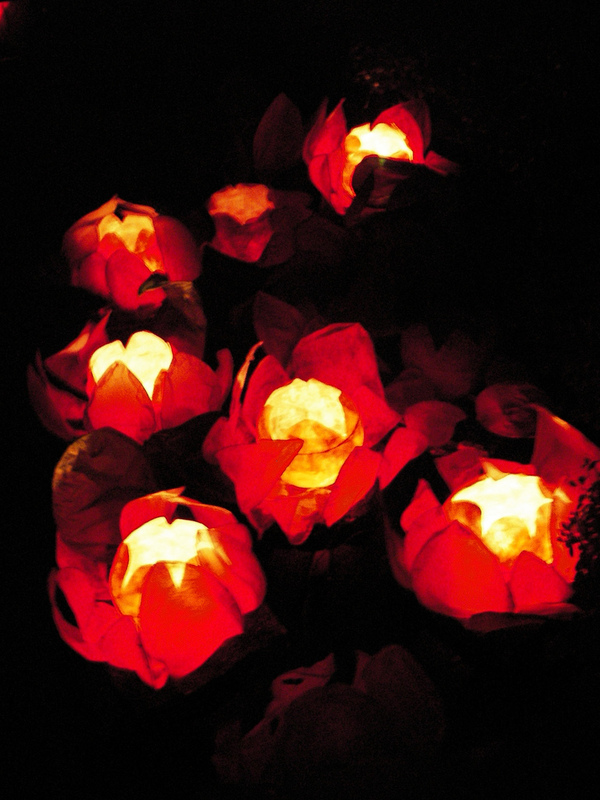 At the end of the festival, red lotus lanterns are placed in water. When the lantern flames die out, the spirits are back home. There are many ghosts in the Chinese folklore. For example, ghosts who seek revenge for the nasty deeds they suffered in life are the Yuah Gui. Shui Gui are ghosts who died by drowning. In death, the Shui Gui seek a fresh, living body to take over. And then there are the You Hun Ye Gui. The You Hun Ye Gui are wandering, lost spirits. They died when they were far from home or were lost. Because the You Hun Ye Gui are wanderers without descendants to care for their spirits, it is feared that they will attach themselves to the living. That is why people do not marry or move into a new house during the Ghost Festival. It would not be a propitious start for a marriage or a home to have the You Hun Ye Gui sticking around. No need to add bad luck to the mix, as marriage and tending house are challenging enough. Many cultures have festivals of the dead, like the Hungry Ghost Festival, Halloween, and Day of the Dead. What are some of your fond memories of these or other “dead fests” in your neck of the woods? Do you know of other festivals like this? Do tell….!!! Schirokauer, Conrad and Miranda Brown. (2013). A Brief History of Chinese Civiliation, 4th Edition. Boston: Wadsworth. 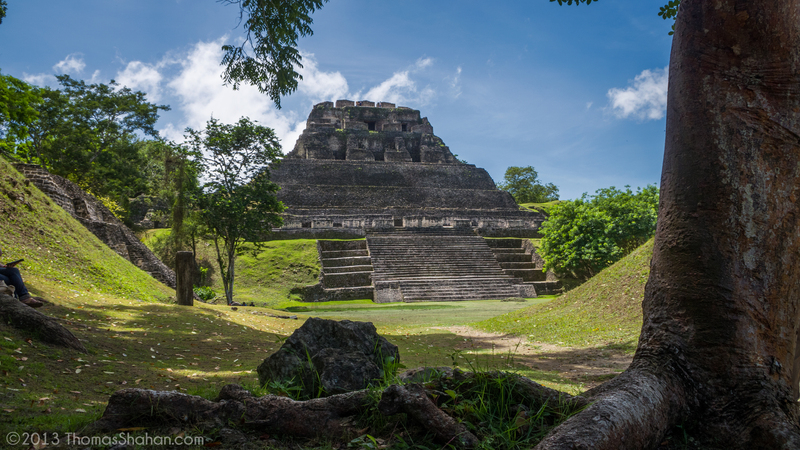 Pronounced “shoo-nahn-too-nitch,” these ruins in Belize remind me of Indiana Jones movies. But instead of a writhing pit of snakes, exploding statues, and a swashbuckling Harrison Ford leaping and flying about, there is a ghost who gently haunts this site. An early sighting of the ghost occurred in the later 19th century. One fine day, a gentleman was out walking near Xunantunich when he saw a woman he’d never seen before. Dressed in a beautiful, white, Maya dress, she approached the ruins. He followed after her. When she turned to look at him, he was startled to that her eyes were fiery red. The mysterious lady walked up the stairs to the highest part of the ruins, El Castillo, and slipped into a cavern. The gentleman raced to the village to get assistance. But when he came back, he discovered that no human could ever hope to go where he saw her enter. It was not a cavern, but solid wall. He was not the first person to see her, and not the last either. Is she the ghost of someone who was climbing to witness a ritual Maya execution? Was she a relative of a sacrificed person? Or does her spirit perpetually re-enact the moments before her own execution? No one knows. Xunantunich is not the original name of this ancient Maya community. Like the civilization, the name is lost in time. 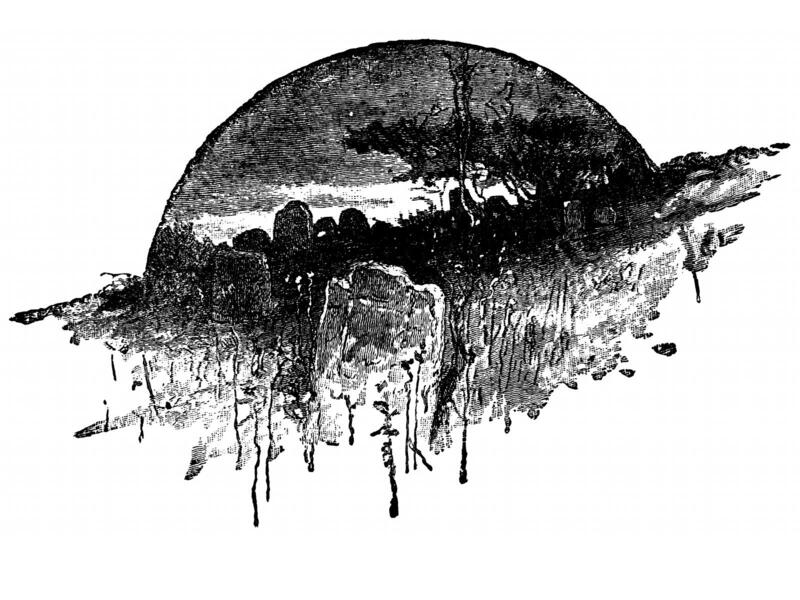 But once the previously lost site was excavated in the later 19th century, the ghost sightings began. Place names often come with a story. Are there any locales or sites near you with a story attached to its name? Do tell! Little did I realize that my foray into the world of ghosts would lead to strong political reactions, academic questions, and time spent poring through books about exorcism rites. What was I thinking? Actually it’s so much fun I can hardly stand it. The Vazimba are believed to be the first settlers in Madagascar. Ruled by queens (!!! ), they were an agricultural people who were considered primitive by the next wave of settlers in Madagascar. That is because the Vazimba did not use or know metal. To the newer settlers, it was almost as if the Vazimba lived in a different age. Why the Vazimba people disappeared is a bit of a quandary. Oral history suggests that their kingdoms (queendoms!!) were conquered by other colonial groups. It is also thought that they succumbed to acculturation. Whatever the process, there is no disagreement about the end result: the Vazimba people and their culture died out. It is an unfortunate and true historical story that often plays out when new settlers come to stay. Although the Vazimba died out, legends and lore suggest that their spirits didn’t go away. Some say the Vazimba haunt grave sites, others say they are found in caves in their historical homeland. According to scholar Hans Austnaberg, they are evil spirits associated with places where people fall ill.
Yeah, this is complicated for many reasons, not the least of which is that the people of Madagascar – the Malagasy – have a strong connection to the spirit world. The subject of spirits and ghosts in Madagascar is a very complex, so I will just graze the surface here. If you are interested in more, check out the resources below for more information. In Madagascar, there is reverence for the dead and rituals for how to treat them. For example, it has been reported that people go so far as to re-wrap and re-bury their dead to make them more comfortable in the afterlife. Ancestral spirits provide protection if they are treated well. Spirits of the non-ancestral dead tend to cause harm. Called kinoly, they are associated with grave sites. Because of the kinoly’s penchant for causing harm, people take grave care when near cemeteries (pun definitely intended). Taboos, such as not making noise near graves, are practiced to avoid bothering the kinoly. The last thing you want to do is irritate a kinoly because it will be the last thing you do. The kinoly like to tear out livers and other organs. So how do the Vazimba figure into the world of the spirits? In two ways. First, if the Vazimba were conquered or assimilated into other cultures, their descendants probably lost track of where they were buried. In that case, the people could not have kept up with their ritual care-giving. Perhaps that explains why there is a belief among some Malagasy that Vazimba spirits are very angry. That would make them perfect ghostly trouble makers, like those who cause illness. Second, over time, the memory of the Vazimba, a long ago people of Madagascar, may have eroded and changed in the popular imagination. If Wikipedia is accurate on this, they are now sometimes viewed as monsters. Described as looking different and/or being of different stature, it is also said that they might not have been human at all. To many Malagasy, the Vazimba ghosts are true and real. They are intertwined in the long-held beliefs in the world of the spirits. A deep part of Malagasy spiritual life, they represent pure, cultural belief. But on a metaphorical level, the Vazimba ghosts can provide a useful, jumping off place for consideration of a broader topic. That human tendency to accuse and label is darker than any ghost story, and one that I hope will finally stop haunting the world’s people. What are your thoughts about this? In what ways does society label the unfamiliar as evil? Austnaberg, Hans. (2008). Shepherds and Demons: A Study of Exorcism as Practised and Understood by Shepherds in the Malagasy Lutheran Church. New York: Peter Lang Publishing. Sharp, Leslie (1994). The Possessed and the Dispossessed. Spirits, Identity and Power in a Madagascar Migrant Town. Berkley, CA: University of California Press. Anne Boleyn was the second of King Henry VIII’s luckless wives and the first to meet her end at the end of an executioner’s blade. Mother of beloved Queen Elizabeth I, she was unable to give Henry any sons in their short marriage. Henry was not patient. When he wanted something, he wanted it immediately. He was probably working on sons with soon-to-be next wife Jane Seymour when he accused his current wife, Anne Boleyn, of adultery. To make things even more juicy, she was accused of an adulterous liaison was with her brother, among others. These alleged, treasonous acts were probably malicious rumors started by her enemies. But they were incredibly convenient, so the King bought into them. The trial was swift and her guilt was declared. Brought to the Tower of London to await her execution, Anne lived out her last days in prayer. Her death was easy, well easy as beheadings go. Queen Anne Boleyn’s reign was significant because her marriage to King Henry VIII changed the course of English history. A very abridged version goes like this: When King Henry fell for Anne, he was already married to Catherine of Aragon. Since Cathy gave him no sons, he asked the Pope to annul his marriage.. The Pope declined. So Henry broke away from Catholicism and Rome. But while he was at it, he broke ALL of England away from Rome and started a brand new religion, the Church of England. Then his marriage to Catherine was annulled by the Church of England and he was free to marry Anne Boleyn. Reviled by many for her liaison and marriage to Henry, Anne Boleyn was seen as a troublemaker who caused her country’s rift with the Church. Others considered her a gifted queen who forged important political connections with France. Later in history, she was viewed as a martyr. 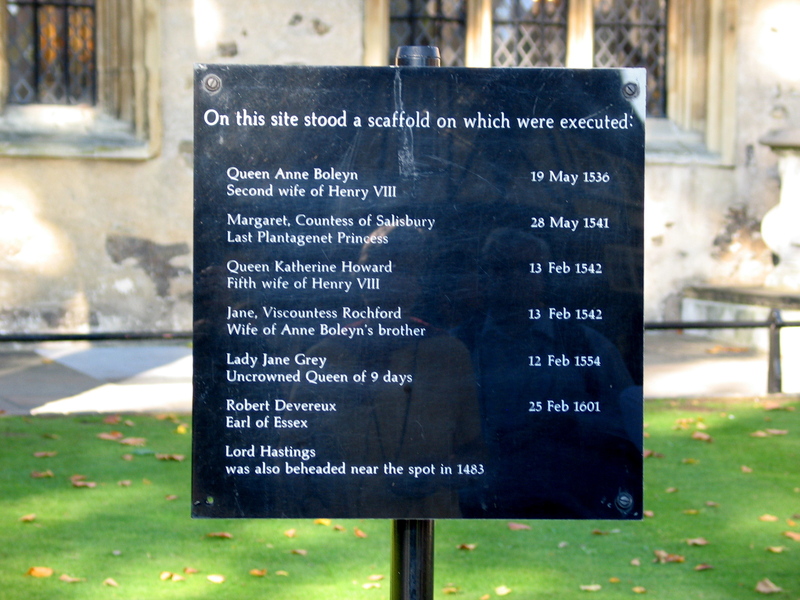 For good or ill, Queen Anne Boleyn was a powerful figure in England. I don’t know when the first sighting of her ghost occurred, but it was seen in many places, many times. On the anniversary of her death, on May 19, Queen Anne’s ghost appears at Bickling Hall in Norfolk. She arrives in style in a carriage pulled by headless horses and driven by a headless driver. In keeping with the theme, she is also headless. She also is seen at the Tower of London. Once, a guard saw an intruder who wouldn’t stop when confronted, so he wielded his sword. Wasn’t he surprised when the weapon went right through her ghostly body. This Tower incident was not only reported by that guard, but witnessed by someone else – the ghost is thought to be Anne. On Christmas Eve, Queen Anne Boleyn haunts Hever Castle, which was her childhood home. She also appears at Windsor Castle, Hampton Court and other places of prominence. Many cultures around the world have folklore that features women who return to haunt and sometimes harm. Typically, those ghosts were women who received poor treatment in life or died under questionable circumstances. The ones who cause harm are categorized as vengeful ghosts. The brutal historical record suggests that Anne Boleyn would fit right into that ghostly clique. But Queen Anne’s ghost doesn’t do harm. She doesn’t toss her head and cry, “Catch!” She doesn’t even say boo. So, if she doesn’t return to avenge her death, what might she be doing instead? I think that her specter returns to remind people about civility and justice. It strikes me as proper and right (and even a bit ironic) for someone who helped change the course of a nation’s spirituality to remind that same nation, through her spirit’s visits, about the consequences of hypocrisy and the abuse of power. As I see it, the ghost of Queen Anne Boleyn is a former head of state using her headless state for the public good. Other famous ghosts who return to haunt…..? Comments….go! Jones, Richard and John Mason (2005). Haunted Castles of Britain and Ireland. New Holland Publishers, Ltd. Things that go bump in the night are bad enough, but THIS? By now, readers of the Daily Ghost Post have come face to face with evil encased in innocence, revenge of revenants, and ghostly “let’s keep up with the Jones’ and kill you off too” experiences. But this one is in a category all by itself. Bedtime is supposed to signify peaceful comfort. A bed is a place of pillows and blankies, coziness and relaxation. Pull the sweet covers up to your chin, sink your sleepy head into an imaginary pillow, and close your eyes. You can go there. You do it every night. Deep sleep is a glorious respite from the ache of exhaustion and the stresses of life. Sometimes we dream, sometimes our sleep is blissfully blank. But one night, in the middle of your deepest dreams, you feel your mind opening up like a flower. You ready yourself to soak up the sunlight of wakefulness. Slowly, your sleepy self creeps up from the rabbit hole of dreamland. You are not quite there though – you are still in that dreamy place between sleep and up. You feel the covers snuggled around you, your skin luxuriates in the sheets and softness. As your mind emerges from the depths, you notice something else. It isn’t snuggly. It isn’t soft. It isn’t comfortable. Not. At. All. Pressing down on your chest is a heaviness so profound you cannot move. You find it hard to breathe. The heaviness envelopes you head to toe. Your bedding feels like it has transformed from angel softness to heavy steel, sheathing you in an invisible, weighted, strait jacket. Betrayed by your bedding, you are desperate to scream but cannot open your mouth. In Thailand, they say that if you experience this, then you have been visited by a Phi Am. The Phi Am is a ghost that likes to sits on hapless sleepers. The weight of the ghost is so intense that it can leave bruises. But the Phi Am doesn’t stay forever. Come morning it leaves the home and seeks another victim. Just reading about this ghost flips me out. In my research about the Phi Am, I have been unable to discover why the ghost does this. I don’t know if it is for revenge, for fun, or just because it is tired and needs a place to rest before continuing its ghostly night hike. But the Thai people aren’t the only people to know this ghost. Brazilians have been sat upon. Many other cultures have been sat upon too. Sometimes the ghost is called a Night Hag. And for the scientific among us, the Night Hag and the Phi Am may be the ghostly manifestation of an illness called sleep paralysis. Let me just state here and now, I don’t care if it is a ghost or medical condition. They both terrify me equally. Just writing about this ghost scares me stiff (yes, pun completely intended, I had to insert a bit of levity before I have a heart attack). Seriously, I find this impeccably frightening, and that is why I send my heartfelt sympathy and good wishes out to all those who suffer visitations like these. May such ghosts or maladies leave you and everyone else alone. What night time ghosts frighten you most? Lloyd, Doris. (2014). Sleep Paralysis: 65 Success Secrets. Emereo Publishing. 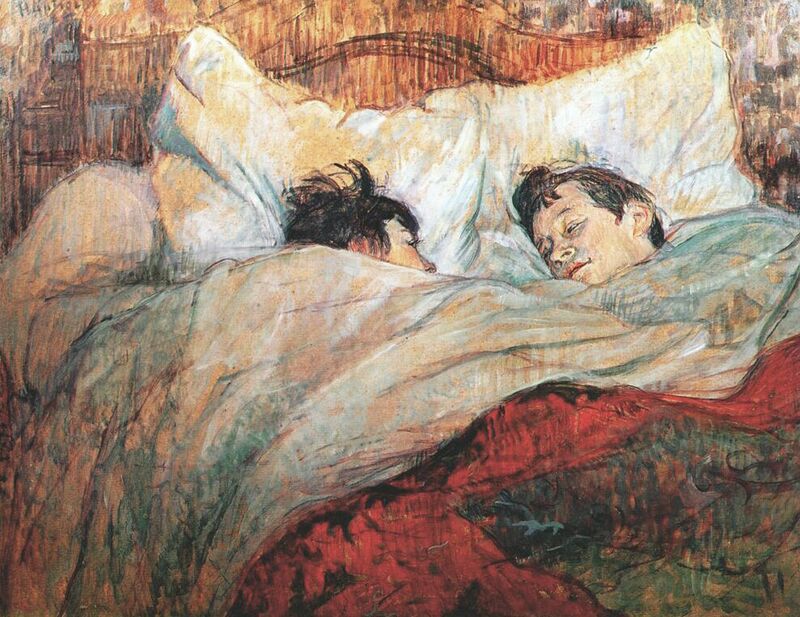 PHOTO CREDIT: “In the Bed” painting by Henri de Toulouse Lautrec / Public Domain / Wikimedia Commons. Nate has always been a history buff. Throughout his childhood, he and his parents visited every Revolutionary War historic site in New York and Massachussetts. Even historic site markers were exciting day trip destinations for his family. Whenever they went down south to visit relatives, they would rack up visits to Civil War sites. One autumn they walked Gettysburg and Nate stood behind every single cannon (it was a long walk). One spring break they went to Antietam, where Nate educated the park rangers about the battle. The summer Nate turned 17, they went to Chickamauga, near Chatanooga, TN. It was late evening when they arrived, but Nate couldn’t wait until morning. He had to get there. Quietly, he sat on a rock, gazing out at the field. As he reverently bowed his head, he remembered that the Battle at Chickamauga cost 35,000 casualties. Included in that huge number were 4,000 men who died in the very field where Nate sat. When he looked up, he saw what he was hoping to see. Glowing, green lights were creeping across the field. “Mom, Dad, didn’t I tell you? There they are! Those are lantern lights of the women who helped at the battle,” he told his parents. But Nate was confused. He thought there would be more than two lights. When they went to the museum the next day, he found out why. “Yep, some people say those lights are the women. But, if you saw only two lights…” and that’s when the docent told Nate and his parents about the Chickamauga haunting. The Civil War Battle of Chickamauga took place some time after Gettysburg. It was a massive, two staged battle. The Confederates won the first stage, and in the second stage victory went to the Union soldiers. But who really wins any battle when there are so many casualties on both sides? The dead and wounded lay on the field for days after the battle. Women came to seek their loved ones in a human carpet of gore. Their lantern lights still linger as it is said that they are patiently hunting to this day. But the docent told them that there are more ghosts who haunt the place. The ghost of a headless horseman roams the woods nearby. Another Confederate soldier is there too. His head was blown off in battle. His eyes are green, his beard hangs long. And there is nothing more to him than that. Old Green Eyes, a disembodied head, haunts the fields near the Chickamauga Creek, searching, searching. Like other history buffs, Nate still scours the past for details about the battles. He knows weaponry and battle strategy. But at Chickamauga he learned something about human nature. You see, it is profoundly human for people to go in search of themselves. We do it in many ways – by getting education, practicing arts, or meditating, for example. We are happy and whole when we find ourselves. But Old Green Eyes is much more literal his search. And when he finally finds himself, the rest of himself, that is when he will finally be at rest. Do you know of any war-time ghosts? As always, I love to hear from you and will write and visit back! Guiley, Rosemary Ellen (2007). The Encyclopedia of Ghosts and Spirits, 3rd Edition. New York: Checkmark Books. The more I read about ghosts, the more I understand the human fascination with them. Their diversity rivals the botanical richness of a rain forest. Over the course of this Ghost Post series, I have touched on dark ghosts, sad ghosts, mischievous ghosts, even a desirable ghost. But today is a day for a nasty one – so N is for the Nasty Nachzehrer. This ghost takes the familiarity of family and friends a bit too far. Normal ghosts are supposed to wander the world wreaking havoc. We expect to see them, hear them, or smell them. Sometimes we get to witness them in ghostly action. That’s why I was surprised to learn about a ghost that can cause dire trouble without ever leaving the grave. Magical power must be its middle name because it causes serious trouble from six feet under. Let’s pretend. Say you lived in Germany during the time of a plague, and you lost an uncle. You would be sad. You would be even sadder when his wife, your aunt, passed away soon afterward. Well that would be wishful thinking. According to German folklore, it is likely that your aunt did not waste away from grief. Your aunt was probably devoured by your uncle. But to get to his wife, your dead uncle didn’t have to move heaven and earth (well earth). All he had to do was move his mouth and chew. This ghostly character is called the Nachzehrer. According vampire expert J. Gordon Melton, his name means “he who devours after death” and he is one stubborn ghost. Actually a revenant (a recently dead spirit who stoutly refuses to leave its corpse), the Nachzehrer doesn’t bother leaving the coffin. With one eye open in the grave, he chews on his burial clothes. As he nibbles, people at home get sick. While he winks that ghastly wink, the Nachzehrer chomps his fingers, bites his palms, swallows his arms, and munches his toes. And his relatives waste away. Like a puppeteer from the dark side, the Nachzehrer is one powerful vampire. His unseen teeth chew on his flesh until his relatives’ flesh is incapable of supporting life. If you ask me, destroying oneself to destroy other family members sounds like family dysfunction at its most profound. Some say that the Nachzehrer is a child born with a caul over its head (the caul is the amniotic sack). Others say that those who die by their own hands can become Nachzehrers too. But plagues are really the Nachzehrer’s plague-ground. Just about any health epidemic can spawn a Nachzehrer- the very first person to die from the illness becomes a Nachzehrer. It’s that simple. So the next time you pass the cemetery down the street, take a good look around. Somewhere, under the innocent turf and hulking headstones, a Nachzehrer may quietly nibble its rotting flesh as it murders its family and neighbors. And that, my friends, is multi-tasking at its most sinister. Melton, J. Gordon (2011). The Vampire Book: The Encyclopedia of the Undead, 3rd Edition. Detroit, MI: Visible Ink Press, p. 283. Even if you have never heard of Minnie Quay, it is likely that you have heard about someone just like her. Similar legends haunt many places. Minnie Quay is famous in Michigan and beyond. She hails from Forester, which is located in a part of the state known as The Thumb. And why The Thumb? The town is situated on the thumb portion of a mitten-shaped peninsula that juts into Lake Michigan. A lumber town at the time of the story, Forester was home to this classic tale of struggle between parents and their teenaged daughter. Back in the 1870’s, John and Maryann Quay lived in a small but cozy home not far from the beach in the lumber town of Forester, Michigan. They had a small son and a teenaged daughter, Minnie. Minnie loved to walk the beaches near Lake Michigan, gazing out to the lake, looking for possibility. Everyone knew when she passed by, for she always left a pretty trail of jubilant footprints zig-zagging across the sand. One day, possibility sailed right in to shore. When the boat docked at the pier, Minnie met a sailor. She was 15 years old, he was older. And the local people didn’t like him. They never liked it when their young women took up with the sailors. Minnie’s parents were no different. She was told that she mustn’t see him. But young love is a powerful force, like storms at sea. Just who is strong enough to stop it? Minnie managed to sneak out and see her sailor whenever his boat docked in town. Everyone knew she met him, because they saw two pairs of footprints zig-zagging across the sand. One day in 1876, Minnie’s parents put their feet down and forbid her to leave the house. Well there was an angry storm in the Quay house. But it was not the only storm that day. A rainstorm with the power and force of young love carried her sailor’s boat and crew to the bottom of Lake Michigan. When Minnie heard, she was distraught. She never got to say goodbye. From that day on, Minnie Quay stopped walking on shore. She simply sat near the pier, gazing out at the lake, looking for possibility. And one day, she found it. Dressed in a white gown, Minnie Quay walked to the edge of the pier where she always met her love and jumped into the water to join him. Though her body was buried in a local cemetery, her spirit is restless. Even today, people see her walking along the beach, gazing out to the lake, looking for possibility – the possibility that one day she might find him. Oh the people know it is the ghost of Minnie Quay – she emerges from the mists wearing a white dress, zig-zags her way across shore, but leaves no footprints in the sand. The Minnie Quay story touches people to the core. How do I know this? It is a musical, a book, more than one ballad , and a beer. I mean when an artisan craft brewery in Massachusetts names a beer after a story from Michigan, it has almost reached meme status. On a more serious note, this romantic tragedy encourages us to believe that sometimes love is strong enough to cross the forbidden bridge between life and death. Maybe that is the real reason why Minnie’s legend endures. But then again, if people still see her ghost emerging from the mists, then that could surely explains why the legend endures. Why do you think tales like this endure? Share your thoughts and let’s get chatting. Dutcher, Denise (2014). Dead Reckoning: A Great Lakes Love Story.